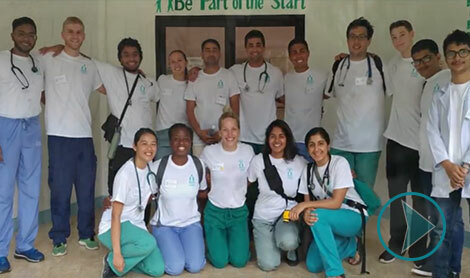 BCF has dispatched more than 150 medical students, in addition to dozens of American and foreign physicians and nurses, to provide care to more than 59,000 patients in the Philippines, Nepal and Haiti, many of whom had never before seen a physician. Our team members also volunteer in orphanages and schools to extend health care to other aspects of life. We’d love for you to be Part of the Start! Before our mission trip to the Philippines, I had never experienced what it meant to be in a third world country. I read books and watched documentaries on the Philippines, but nothing can truly depict the incredible kind, openhearted, and gracious people of this beautiful country. It was a life changing experience that I hold close to my heart, and I find myself reminiscing about my time spent there at some point every day. I don't think I will ever have an opportunity like this again in my lifetime. With no medical experience, Dr. Schuster and the medical students opened their arms to me with acceptance and encouragement when I volunteered in the clinic. For them, any extra hands were useful and we worked together, bonded by one underlying purpose - to help the people of this country in any way possible. Resources were limited, but no patient was turned away. It was a bittersweet feeling, knowing that we were doing anything in our means to help, but also a feeling of tremendous guilt that we couldn't give enough. The vast differences between our lifestyles are unfathomable, and the tremendous struggle that some of these patients went through to stay alive has completely changed my outlook on life. While we saw a lot of sickness and disease in the clinic, sorrow and depression are not words to describe the people of this country. The Filipinos I met were some of the happiest, most generous and warm people I have ever met. It was a blessing to be able to live in their country for three weeks, and they were so grateful that we were there to learn and appreciate their beautiful home. Because some of the volunteers did not have much medical experience, we found our presence would be of better use at the local elementary schools. We spoke with the administration at two different schools and they happily allowed us to set up after-school volleyball and soccer camps. In addition, we gave public health and leadership lessons to some of the older classes. The children were all very hard working and dedicated to their education. Some were shy at first, but after they opened up, I saw some of the most energetic and appreciative faces I have seen in a long time. We donated the equipment and some dental-hygiene supplies after our visits, and the kids rejoiced around us with such emotion - I could not hold back the tears myself when we left. While I have countless memories in the Philippines, I can in no way compare one experience to another, for every day was a new adventure. However, I left a piece of myself there when one of Jen Schuster's Aunts named her beautiful newborn baby girl after me. I have never felt more honored in my life, and it made it quite difficult to leave for home in the US. But now I have an excuse to return as soon as possible. The Bicol Clinic Foundation and the Schuster family are truly heroes in my eyes. They bend over backwards looking for means to continue the work they do in the Philippines and other third world countries. Not only do they provide help to people in need of medical assistance. They openly and graciously provided me with the opportunity to join them in the fight for their cause - a truly powerful and life changing opportunity that I will never forget.